It's not often that I pick up a knitting-related book, skim through it, and then sit down to read it cover to cover. 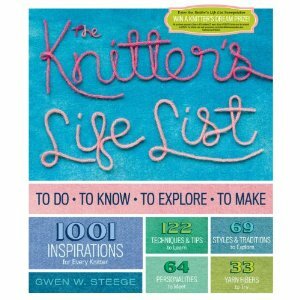 This was the case when The Knitter's Life List by Gwen W. Steege arrived in my mailbox last week. In the span of 2 days I had read it cover to cover, and will revisit it often. This is a book that's different than any other I've seen and that's refreshing. It's not a book of patterns, although there are links to many. It's so much more. Personally, I have a knitting life list. I want to travel and see the world, visiting yarn shops whenever I stop in a new area. I want to take classes with amazing teachers and learn as much about my obsession as I can. I keep attuned to the latest trends and find that my favorite projects tend to be more classic and will withstand the test of time. I'd like to learn more about what makes a pattern popular or timeless. This book is going to aid me in all of these goals and pursuits. It will not be sitting on my bookshelf to be dusted off every now and then. I'll be using it as a reference, a checklist. Most of my knitting books are in perfect, like-new condition. I know that I'll be writing in this one, making notes and check marks as I see what I've already accomplished and what I might move on to next. The topics are wide and varied. Take Chapter 4, "The Socks Life List", for example. It starts off with the list: who do you want to meet, or have already met? Charlene Schurch or Stephanie Pearl-McPhee for example? Next, what would you like to discover? Tweed socks yarns or the history of knitting. What do you want to try, learn, experience? Where do you want to go? After the checklist are sections on techniques, secrets to sock success, tips, quotes from designers, a story about sock knitters during the war, yarns and needles, charity knitting, etc. All of this is just in the chapter about socks. You'll also find chapters about yarn, know-how, sweaters, scarves & shawls, hats, gloves & mittens, bags, kids-knit, home dec as well as the fiber-lover's life list and a section on who's who in the community of knitting experts. - Go to Meg Swanson's knitting camp and take a class from the lady herself. - Visit places like Peru or the Baltic region and meet and learn from the local knitters. - Teach at events such as Stitches or Madrona, somewhere in the UK, etc. - Take classes from teachers such as Alice Starmore, Kaffe Fassett. - Write a knitting book. Maybe I'll finish the Matilda the Bear stories and knitting patterns one day. Collect my patterns into a book, design more. - Visit Rowan Mills in the UK. Take a class and meet in-house designers. - Make a significant dent in my stash. Well, that's a start. The bottom line about The Knitter's Life List is that it's a wonderful book. To say that I like it a lot is an understatement.